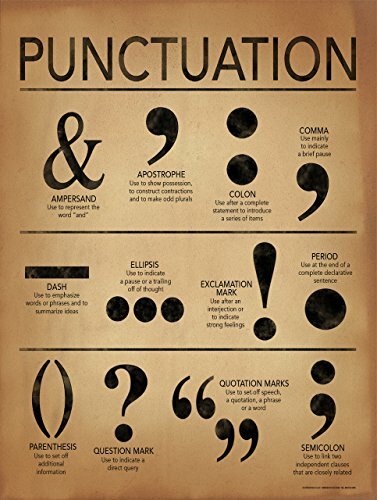 This classically designed poster features major punctuation with a brief explanation of how each is used. Each art print measures 18 x 24 inches. Printed on heavy 100 pound cover stock paper. This durable paper won't wrinkle and crease like typical poster paper. Features ampersand, apostrophe, colon, comma, ellipsis, exclamation mark, period, question mark, quotation marks, and semicolon.